Check out the New Living Expo Friday through Sunday, April 26-28 at the San Mateo Event Center in San Mateo! For tickets and more info, click here. 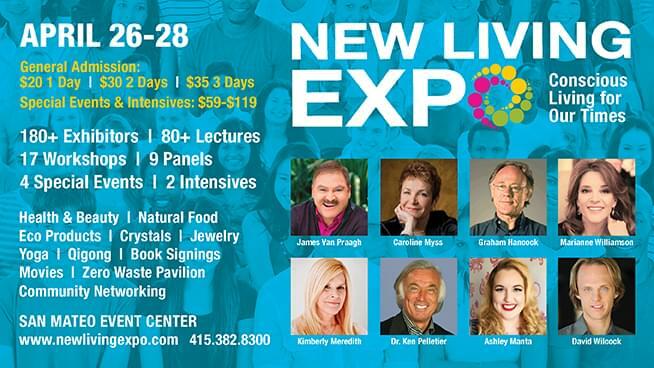 The New Living Expo brings over a hundred influential authors, experts and practitioners who will present various lectures and workshops April 26-28 at the San Mateo Event Center. Authors Marianne Williamson, Caroline Myss and James Van Praagh are joined by David Wilcock, Kimberly Meredith, and Graham Hancock as some of the best-known presenters at the Expo this year. On Friday night there will be a special screening of the film Searching for the Lotus-Born Master with the film’s director Laurence Brahm to discuss the film. There will also be a special sustainability program featuring a Recycling and Zero Waste Pavilion organized by Portia Sinnott and the Northern California Recycling Association. Check out the day by day schedule here.